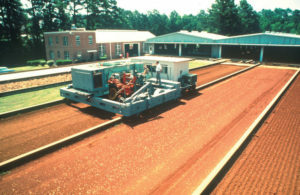 Rail equipment allows for minimum-impact testing at Auburn’s Soil Dynamics Lab. A venerable soil research facility at Auburn University with roots stretching back to 1935 is expecting a $43 million funding infusion from Congress for a new facility that will continue its work of improving global food production. The funding will establish a new USDA Agricultural Research Service Soil Dynamics Laboratory at Auburn as part of the agency’s capital improvement strategy. Its work will focus on improving the productive and sustainable use of soil and water resources for increased crop and livestock production. Originally known as the Farm Tillage Machinery Laboratory, the facility was built with nine outdoor soil bins, each about the length of a football field, containing soil with compositions varying from sand to clay. The outdoor bins, resembling huge outdoor bowling lanes, were needed to conduct research on the impact of full-scale machines on farm soil, according to H. Allen Torbert, NSDL research leader. Test equipment that evaluates tillage implements and traction devices slides along on beams above the bins so that the soil isn’t disturbed. The Soil Dynamics Lab has yielded research to further an amazing variety of efforts, from improving military tank tracks during World War II, when generals wanted to ensure their progress wouldn’t bog down on the shores of the South Pacific, to improving the tire design of the Lunar Roving Vehicle. Research in the soil bins by Bell Lab engineers provided design information for a track-laying vehicle and “plows” to bury communication cables in the ocean floor. Scientists from England, Germany, Greece, Turkey, Australia, South Africa, Uruguay, China, Japan, Brazil, Paraguay, Italy, Poland and Russia have studied at NSDL over the years. The facility was the brainchild of Mark L. Nichols, then head of the Agricultural Engineering Department at what was then Alabama Polytechnic Institute. The lab has continually contributed to the USDA mission of increasing food production. Farm-level sales of agricultural products produced in Alabama exceeded $5.5 billion in 2017. Given the world’s growing population, some estimates suggest food production must increase by 25 to 70 percent by 2050. Agricultural research and advances are required to meet this growing demand in a sustainable manner.